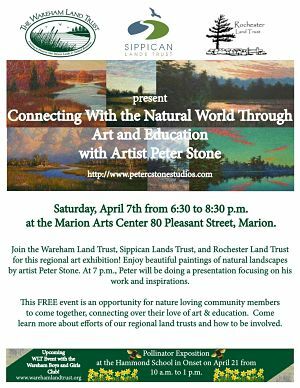 We are collaborating with our regional friends at the Sippican Lands Trust and Rochester Land Trust for this program Saturday evening, April 7th, 6:30-8:30 pm. Enjoy beautiful paintings of natural landscapes by artist Peter Stone. Peter will be presenting his paintings and the inspiration behind them. 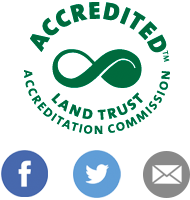 The land trusts will have informational tables highlighting the work we do in our communities. We hope you’ll join us for this fun and informative event. This will be a wonderful opportunity to find out more about land trusts and how you can become more involved. Refreshments will be served. Marion Arts Center, 80 Pleasant Street, Marion MA. Directions/map.